This is a very slowly roasted dish, which means the meat becomes beautifully tender without drying out – perfect for piling into rolls and serving with warm apple sauce. For a great-tasting apple sauce search Waitrose recipes. Preheat the oven to 150°C, gas mark 2. Strip the leaves from the thyme stalks and place in a mini chopper with the garlic and lemon zest. Add a little salt and whizz to make a paste. Stir in the lemon juice and olive oil. Brush the mixture all over the flesh of the pork then sit it, skin-side up, on a rack set in a roasting tin. Using kitchen paper, pat dry the skin and wipe off any stray thyme mixture. Sprinkle lightly with salt. Cover with foil and roast for 5 hours. Increase the oven temperature to 220°C, gas mark 7. Remove the foil and cook for a further 30 minutes so the skin crackles nicely. Leave to rest for 20 minutes. Using a large, sharp knife, cut the crackling off the joint then cut it into pieces. Carve the joint, transfer to a large platter and cover with foil to keep warm. 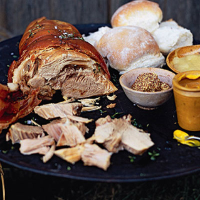 Split and butter the rolls, then invite guests to make up their own hog roast rolls with the pork and the Warm Bramley Apple Sauce (see below). Apple and pork is a classic combination and a hog roast is a wonderfully English occasion, so refresh yourself with this English cider from our farm in Hampshire. Peel, core and dice 4 Bramley apples and 2 Cox apples. Place in a pan with 100g caster sugar, the leaves from 2 rosemary sprigs and a large knob of butter. Cover and simmer for 30 minutes, stirring occasionally until the Bramley apples have formed a soft purée. Serve the sauce warm.